At the 2009 World Athletics Championships final, a famed Jamaican sprinter set the world record for the 100-meter dash, clocking in at 9.58 seconds and making fans ponder ever since: just how fast does Usain Bolt run? No one has been able to surpass his time yet — not even Bolt himself. Given his prowess of the 100-meter dash, many have described him as the fastest man in the world and they might just be right. The answer to that question depends on distance. When Bolt ran his record-setting 100-meter in 2009 at 22 years old, he averaged at and peaked at more than 27 miles per hour. But that speed can't be sustained over longer distances: Bolt's best 200-meter speed is 19.19 seconds (also a world record, by the way), his best 400-meter speed is 45.28 seconds, and his best 800-meter speed is 2 minutes and 10 seconds. 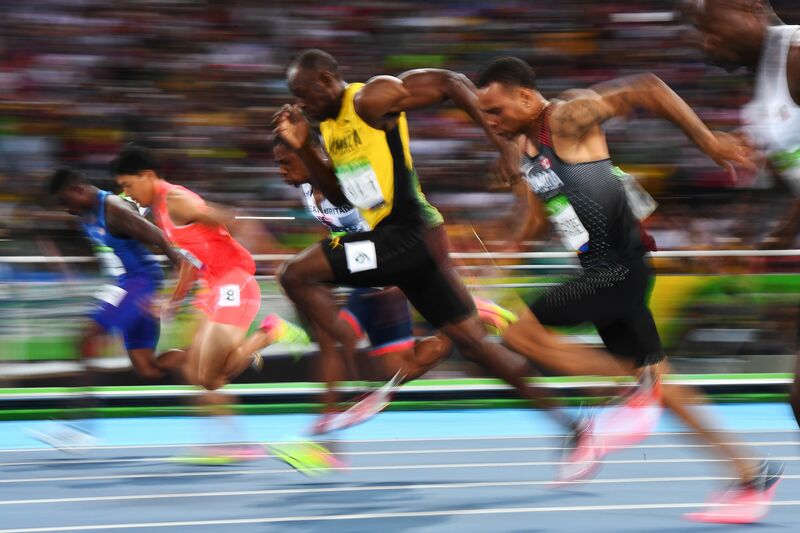 Longer distances would require Bolt to pace himself more than he would during a short race, like the 100-meter, which is more about speed than endurance. That's not to say that Bolt wouldn't run a speedy mile: Zebulon Lang, an assistant track and cross-country coach at Cornell University, told The New Yorker's Charles Bethea that he thinks Bolt could run a mile less than five minutes, based on both Bolt's speed during short races and the at which times other athletes have completed longer races. However, other experts disagree that Bolt's training as a sprinter would adequately prepare him to run a quick mile. "Speed over short distances does not automatically guarantee relative speed over long distances," Ross Tucker, a professor of exercise physiology at South Africa's University of the Free State told Bethea. "What a 100 or 200-meter sprinter relies on is incapable of meeting his demands over a mile. By definition, the training a short-distance sprinter does is in polar opposition to that of a middle-distance runner. One hundred-meter speed translates pretty well up to 400 meters. But after that there is a large change." Nonetheless, Bolt remains the best at his sport: sprinting. On Sunday, Aug. 14, Bolt became the first sprinter to win the 100-meter race at three consecutive Olympic Games. He came close to his 2009 record, finishing with a time of 9.81 seconds. U.S. sprinter Justin Gatlin came in a close second, clocking in at just 9.89 seconds. Bolt, who is now 29 years old, has previously said that Rio will be his last Olympics. He's not done with running yet, however; he plans on retiring next year after the World Track and Field Championships in London, where he hopes to best his own 200-meter world record. And based on his last record-setting race, it doesn't seem like his career will be over anytime soon.